I just can’t seem to get myself together. One day it’s cold. Another it’s not. One day it rains. Another it doesn’t. Kind of like me. A Pisces kind of day. Back and forth. Back and forth. The only thing to do is sleep. Zzzz…zzzzZZZZZZ….ZZZZZZ. 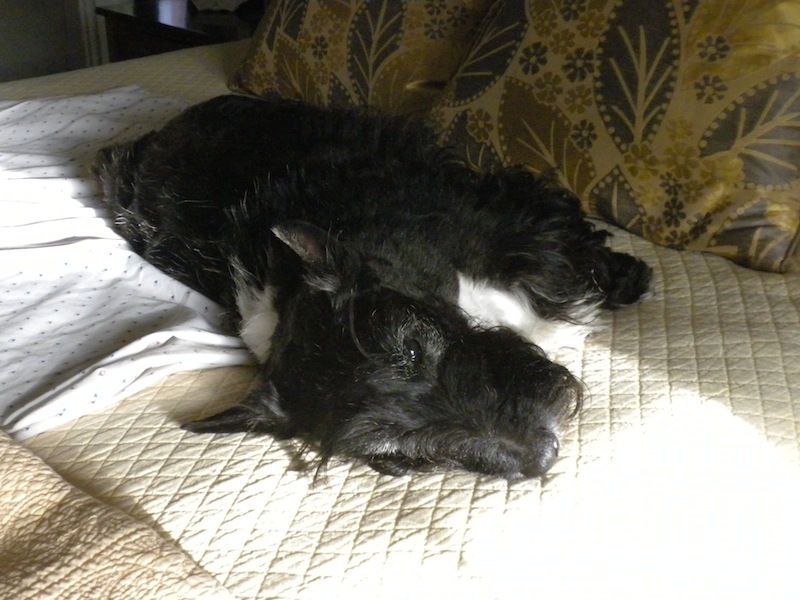 This entry was posted in The Scottie Chronicles and tagged dogs, Scotties, The Scottie Chronicles. Bookmark the permalink. As a fellow Pisces (and someone who deals with Oklahoma’s bipolar weather), I feel your pain! Hang in there!! You forgot to the snow one day and one day not. We had snow flakes today. I’m wide awake and ready to go. I’ll keep watch today. We had that last Friday…now we gots good weather and just cool enough to run around like Mad till we are worn out……..Sleep some off for us! Yup, there are days like that! Don’t fight it, just give in to it and sleep… soundly…Zzzz…Zzzz…zzzzz. Thats the way it is here too and yep best thing to do is SLEEP!! Looking very comfy there Stu.